There are a lot of cheesy, low-budget World War Two movies out there, especially in the last few years. IRON SKY is one of my particular favorites, a "Nazis on the Moon" film full of good, dorky fun. 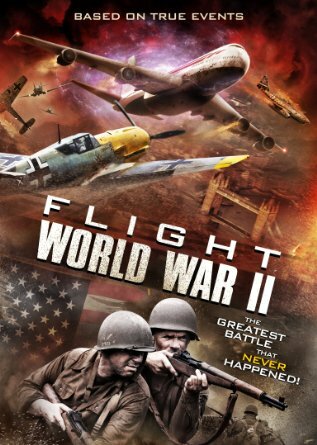 A few days ago, I happened to notice another low-budget WW2 movie pop up on Netflix, FLIGHT WORLD WAR II, about a modern passenger airliner that time-travels back to the beginning of the Second World War and "must change the course of history" in order to return. Okay, this sounds kinda dumb, but for a lazy Sunday morning, I'm intrigued. So I gave it a view, and like most movies put out by The Asylum, it was pretty corny. The only actor of any note at all is Faran Tahir, who plays the airliner's captain, and is the same actor who played the captain in the first few minutes of 2009's STAR TREK reboot. Aside from him, it is the usual cast of C-grade direct-to-video/streaming talent, some of whom do a decent job with what they have to work with, while others are just cringe-worthy. The SFX were actually pretty good, which says something about a "shoestring budget" movie studio being able to put German fighter planes into dogfights, or depict an entire city being bombed to rubble. Plot-wise...well...things get rough. A 757 en route from Dulles to Heathrow flies through an "anomaly" and winds up in June 17th, 1940. They overfly a city being bombed, and a couple of history professors (WW2 buffs, of course) identify some German bombers, and that the city is on the coast, but we also see an Me262 do a fly-by of the airliner. The history nerds surmise that the city is St. Nazaire (thus the date), but are boggled that the German jet fighters are operational in 1940, about four years before they'd take to the air in force. And, after contacting a British radio operator, they find out that the Dunkirk evacuation was a complete disaster, resulting in the loss of half a million people (in reality, it was the exact opposite). In addition, they learn that the British don't even have working radar systems - they're still in development (again, not true to actual history). After some confused head-scratching, the nerds postulate that they've fallen into an alternate timeline, where the Germans are much more technologically advanced at this point in the war, having operational jet fighters while the British don't even have radar. The Germans attack the airliner several times in the hopes of shooting it down, but the pilot manages to avoid death (the 757 somehow survives dozens of 30mm cannon shell hits, but hey...Hollywood, am I right?). The British are worried that, if the airliner *does* have radar (the way in which all this gets concluded is very odd), they must shoot the plane down to prevent the Germans from possessing it and getting even more of an advantage. Eventually, the airliner crew cut the radar free from the nose of the plane, drop it down to the British, who then use it (!!!) to direct Spitfires out to defend the airliner just before the plane flies through another anomaly and back into our normal timeline. I'd like to point out that, as ridiculous as this plot is, a half-decent film could have been salvaged from this wreckage. The 1980 film THE FINAL COUNTDOWN postulates what might happen if a 1980s era aircraft carrier wound up in the Pacific just before the Japanese attack on Pearl Harbor. 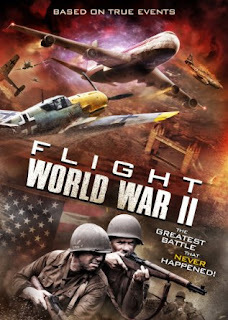 With the premise of FLIGHT WORLD WAR II, a story of how a modern airliner (with its far superior air radar), as well as two nerds who know everything about the war, could turn history around in an alternate past where the Germans are clearly dominating even more than they were in our own 1940. EDIT: Apparently modern airliners don't carry any kind of radar, relying on their transponders and Air Traffic Control systems to guide them around potential hazards. So, basically, this movie is pointless when it comes to the whole radar angle. But instead, things are just bungled. My biggest complaint is that the plane flies across the Atlantic and winds up over the French coast. Fine - no big deal. They even claim at one point to have (I think), just under half of a full fuel load. I just looked it up, and Dulles to Heathrow is a little under 3,700 miles, while the 757 has a range of around 4,500 miles. So, this jet winds up over St. Nazaire with about 800 miles of fuel left - certainly a lot less than "just under half a tank". However, any pilot will know that if you're somewhere near the coast of France, just pointing your plane north and flying for (in this case) about half an hour will put you over England, at a 757's cruising speed of a bit over 500 miles an hour. Instead, somehow, this plane spends the entire movie flying *east*. At one point they even figure out they're near (IIRC) Reims, which is to the north-east of St. Nazaire by several hundred miles, and at another point they're near Metz, *four hundred* miles from St. Nazaire. Hey, guys! You're going the wrong way! And, what makes things weirder, by the time they are near Metz and drop the radar system, it is picked up by British forces after a brief firefight against some Germans, and within a couple of minutes, it is in the hands of the radio operator they've been talking to the entire time. So, apparently, despite Dunkirk being a total slaughter, this radio operator is *hundreds of miles* behind what are now the enemy lines? How does this even make any sense? Even if the radio operator was behind enemy lines and the salvation of the war effort was to get radar into the hands of the British, the operator should have just said "Fly north for half an hour and get to Blighty, you bloody fools!". The British are even trying to shoot the airliner down "to keep the radar from the Germans". You know how you could also do that? Tell them to fly to England. Shooting down a great big, obviously not the usual 1940s prop plane, over enemy territory is probably the worst thing they could do! At one point, one of the passengers tries to take over the plane, insisting that, with the help of the history nerds and their books, they could find and kill Hitler and re-write history. An Army sergeant flying aboard the plane talks sense into him and the rest of the passengers, pointing out that pulling something like that off is highly unlikely, and the most likely scenario is them letting both the airplane, the history nerds, and all their history books fall into the hands of the Nazis, making everything worse. This was probably the moment of the film that made the most sense. To conclude, this movie was more disappointing as a story than it was as a technical production. I'll always give The Asylum a pass on production values and acting - all that requires a lot of money and time, which they don't really have - but a good script and a plot that makes sense just requires a competent storyteller and a modicum of research. This movie *could* have been made on the same budget, with the same cast and production values, and made a lot more sense. The second in this six-volume series kicks off a short time after the invasion of Russia by the German army in the summer of 1941. Rather than their lightweight Panzer II, this time Micki Boden and his crew are operating a Panzer III, one of the mid-war models with a short-barreled 50mm anti-tank gun. The extra crew members are characters we were introduced to in the first book, as coming from one of the other Panzer IIs in Boden's platoon. Like the first book in the series (and most of the books, as I've now read the first four of the six as of this review), there is no real overarching plot to each book. Rather, the novels are a series of vignettes tightly tied together, providing a good representation of whatever is occurring in that theater of operation at the time. In this case, Boden and his crew are involved in Operation Barbarossa, during the operation's heyday from summer to fall of 1941, before the brutal winter sets in and the German advance is stopped. For the most part, Boden and his panzer crew encounter relatively little resistance from the Russians, and their biggest problems are the over-stretched supply lines, coupled with a new platoon commander who proves to be a constant nuisance to Boden and the rest of the platoon. This new commander isn't a veteran of the '39 or '40 campaigns, and so lacks the necessary combat experience to lead a platoon, especially as the panzers wander further and further afield. This becomes especially problematic when one of Boden's crew is injured, and they have to seek medical aid from a local Russian doctor. Food also becomes an issue, as they've ranged so far ahead that the "goulash cannon" (field food service units) are nowhere to be found and they must forage locally for their rations. Throughout the book, there are many hints as to how the entire Russian campaign is a bad, bad idea. Early on, Boden's crew discovers an intact panzer...but the five-man crew is dead, each man decapitated, their bodies left in their proper positions inside the tank, their heads put on display outside the hamlet where they parked, probably to also forage or rest for the night. This gruesome display puts Boden's men on edge, because it hints at the savagery the Russians are capable of, and how tenacious a foe they can be if given a chance. Later on in the book, Boden joins in defending a position against a Russian counter-attack, one that is bolstered by the deadly Russian T-34 medium tank. The T-34 outclasses the Panzer III of the time in almost every respect - main gun, armor, and mobility - and they're the boogeymen of the Russian battlefield. The climax of the book is a tank duel between Boden and the rest of his platoon against several T-34s in an abandoned factory, and it is a tense, exciting scene where clever tactics and luck face off against far superior Russian tank design. 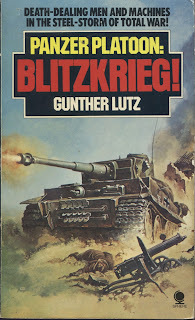 This book is definitely an excellent sequel to BLITZKRIEG, and gives the reader what they really wanted from a series called "Panzer Platoon" - battles between tanks which are roughly equivalent to each other. 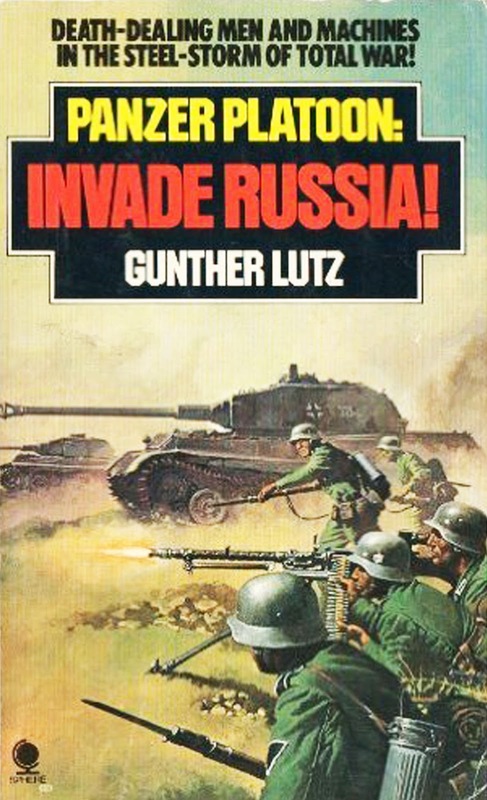 The action is well-written and shows how careful and analytical a panzer commander needs to be in order to survive on the battlefield, and as mentioned, this book does a great job at hinting towards the horrors of the "Ostfront" (which we see in full force in the next volume, BLOOD & ICE). Sorry, Tiger tank - wrong year! The PANZER PLATOON series is a six-book run of WW2 stories told from the perspective of a German tank commander. The series was written through the late '70s and published by Sphere Books, a UK paperback publisher. 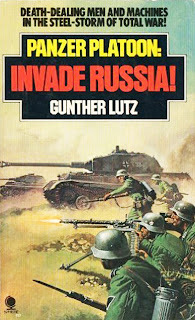 The author, "Gunther Lutz", is probably a pseudonym, and I am following some leads to track down the author's real name. 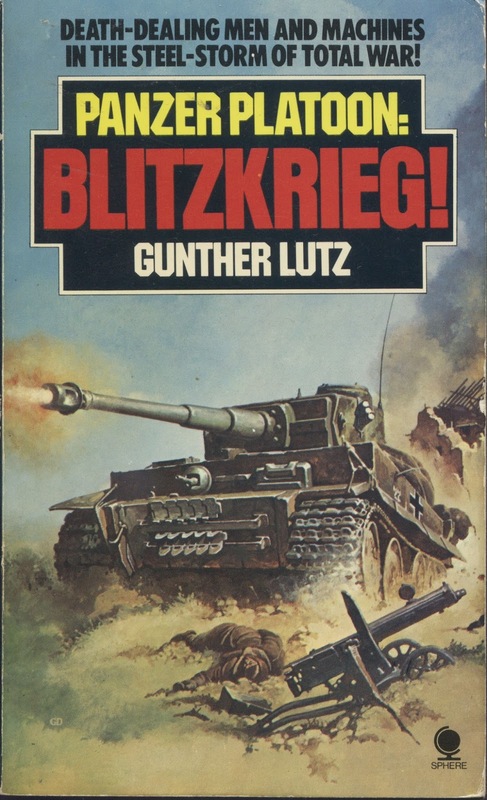 The first book in the series, BLITZKRIEG, follows Micki Boden, an Unteroffizier commanding a Panzer II light tank. What exactly Boden's rank is gets kind of muddled - sometimes he is referred to as a corporal, but the rank could be higher than that. Boden is in charge of two men, his driver and his loader / radio operator, and we know at least Boden and his driver were in the Polish campaign of 1939. The loader/operator is a Nazi fanatic, always going on with party slogans and ideology, and it is made clear that Boden considers himself a soldier first, but he rolls his eyes and actively makes fun of his loader/operator for the young man's fanaticism. I feel like this is a requirement of every German protagonist in WW2 fiction - he's just doing his duty for his country, not one of Hitler's goose-stepping puppets! At the very least, it lets you sympathize with him more, since you're not just chomping at the bit, waiting for Boden to get vaporized by a howitzer shell. The story itself is essentially a series of vignettes, as Boden and his crew make the race to the French coast. The French and British forces are collapsing faster than the Germans can advance, and Boden's tank platoon finds itself often just passing by wrecked or abandoned Allied equipment, often destroyed by airstrikes. His first action in the book is to support a company of assault pioneers as they take a French bunker. This assignment separates Boden's tank from the rest of his platoon and the regiment, and most of the book is spent trying to catch up with their unit, which allows for some smaller-scale battles, pitting Boden and whatever band of Germans they come across against some token French or British forces. The action in this book is pretty well-written, and the author largely knows his technical details, although there are a couple of glitches here or there. A common editing mistake in this book is that the author sometimes mis-types "cm" and "mm" for weapons, so he'll reference a "20cm" anti-aircraft gun which is no doubt the German 20mm AA autocannon, and this sort of thing happens a few more times throughout the book. In my experience, Germans tend to refer to their weapons by centimeter caliber, while the British refer to them by millimeters, so I think the author just never quite figured out which he wanted to use and there was the resulting mixup. There are a couple of other minor details that he gets wrong - for example, the KwK 30 autocannon in his Panzer II can fire both armor-piercing and high explosive ammunition, but the author states in the book on a couple of occasions that it can only fire AP. Whatever - it doesn't really matter, and there's a lot of other good information to make up for a couple of small mistakes. There are several tank duels between Boden's Panzer II - a very light tank, more equivalent to an armored car than what we'd consider a real frontline tank - and both French and English tanks. Each scene is very tense, and the author does a good job of showing Boden's tactical prowess, maneuvering and picking just the right ground to fight from and the right moment to attack to make best use of his limited firepower. Those not so aware of German panzer history might not know it, but in the first few years of WW2, the majority of Germany's panzer inventory were light tanks, inferior in armor and firepower to the enemies they faced off against. It was their superior tactics, communication, and supporting elements that gave the panzers their victories. This is very well illustrated throughout the course of the novel. Overall, I really enjoyed BLITZKRIEG. I was concerned going into the book that it was going to be a lot worse than it was, and although there are some cheesy interludes here and there (2 1/2 books into the series now, I see that the author likes having his characters encounter women during their downtime, with the usual "mature content" results), overall these books feel very gritty and unglamorous. A lot of men die very brutal, pointless deaths, and the survivors must carry on and do their duty no matter what. These books were not particularly cheap to come by (I think I paid $10 for this book, not including shipping), but if you like WW2 fiction written at the height of the British War-Lit era of the 60s through early 80s, I think you'll enjoy the PANZER PLATOON series.